I have been wanting to try my hand at cooking or baking with tea for awhile. It just intrigues me...and I like to try new things. And of course I like to eat! (I like that part a little too much sometimes). 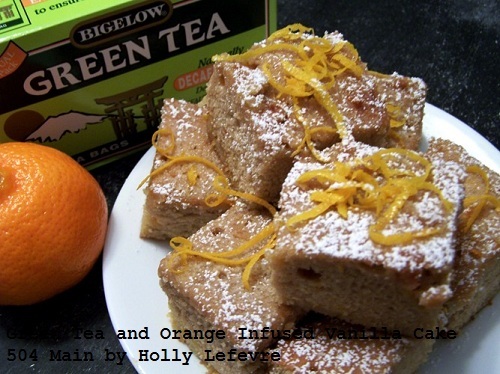 Honestly I was not sure exactly how to cook with tea, but the other day I did a shop for Bigelow Tea and while perusing their website saw they had a recipe section. 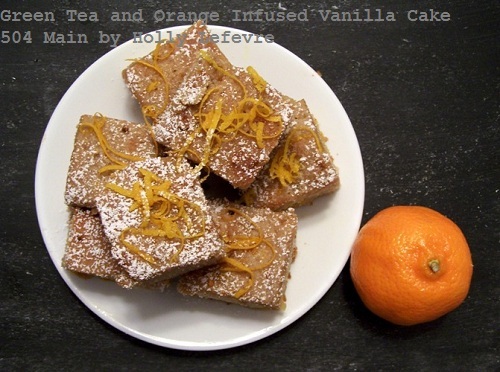 I looked over the many ways they used tea in their recipes and then decided to try my own hand at baking with tea. Now I have to tell you...it was delightful! And I cannot wait to try more ideas! One can mandarin oranges, strained with the juice reserved. Heat the milk on low in a saucepan; Place three-four tea bags in the milk; Heat until the milk begins to bubble. It took about 8 minutes on my stove; Let cool. NOTE: Be careful with those tags on the tea bags - OOPS! I burnt them - then I cut the tags off. Cream softened butter with sugar in a mixer. Add eggs; mix until incorporated. And the Almond Extract, if you wish (go ahead and skip it if you don't like Almond). Squeeze the liquid out of the tea bags and add the cooled milk to the mixer. Mix to incorporate. Mix together the flour and baking powder. Add the dry ingredients to the wet ingredients. Fold in the mandarin oranges. Place in the prepared pan and bake for 30 to 40 minutes. Set your timer for 30 and check for doneness. Poke holes in the cake using a skewer. Combine powdered sugar, mandarin orange juice and vanilla in mixer and mix until blended. If it is too runny, add more sugar, one Tablespoon at a time. Pour glaze over the cake. NOTE: you may not choose to use all of your glaze at this stage. It depends on the level of sweetness you desire. I made this cake for my friends when they came to craft...they loved it. My hubby is enjoying it too much...My son also thinks this is amazing. It is moist and, well, just delicious! Have you ever cooked or baked with tea? All these tea posts have me wanting to try infusing tea into something too. The cake looks and sounds so delicious!!! Any "poke & soak" cake is right up there in my book!! 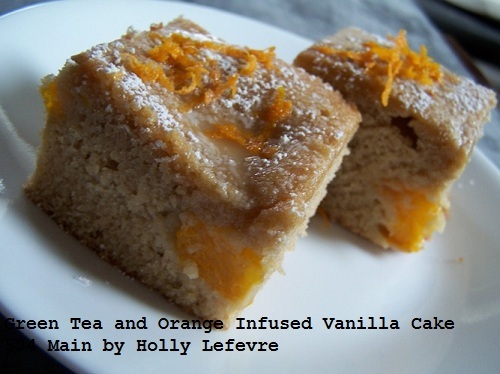 And what a fabulous combination of flavors...sounds delicious, Holly! What a great combination of flavors! I love a moist cake, and this looks really delicious!! I've never tried to cook or bake with tea, but I'm a tea drinker so I think it would be fun to try. Looks amazing Holly! I'll have to try something like this soon! See you in 5! This looks DREAMY... and mighTEA delish!!! Yummy! Looks moist and delicious. I like your helpful tip too about the tags...super important! Wow, thanks for this one. You've given a me a very bright idea on what else can I do on my tulsi herbs. I think I will create a delicious cake like this one. How long did it took you on preparing it. Thanks for stopping by and joining the conversation! I sure hope you come back for more! These blog posts - tutorials and recipes and advice - are meant for inspiration. You must always keep your own skill level in mind when attempting a project. You should take proper safety precautions and wear proper safety equipment. Undertaking a project with my tutorials, suggested products or tools is at your own risk. All images and text is copyrighted 2009 to present by Holly Lefevre (or appropriately credited authors/photographer). 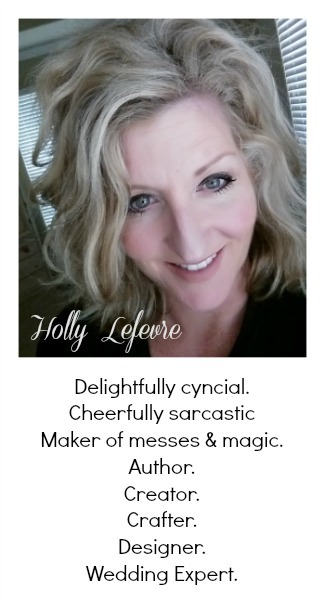 I love to share and connect with companies, people and other bloggers. One photo and a link to the specific post is allowed. PLEASE do not use an entire post (including photos) unless their is a written agreement between us. Photos of the kids are not for sharing (unless you ask for permission). Thanks for keeping it friendly! Most products I blog about are because I LOVE them and I am receiving no compensation whatsoever. I will not recommend a service/blog/product that I feel does not meet my standards or expectations. From time to time, Holly Lefevre and/or 504 Main receives products or services free of charge for a review or product demonstration. My opinions are always my own.